Amalgama is a modern restaurant offering International cuisine. The average price of a 3-course meal at the Amalgama restaurant is 30 euros. Note that although GoMadrid.com strives to maintain all information about Amalgama up to date, the prices mentioned are only an indication and may not reflect the exact value of your meal. In the heart of Madrid between the Plaza de Opera and the Plaza de Sol, Amalgama offers a curious blend of four very different international cuisines. The restaurant features dishes from Mexico, Japan, the USA and Spain in a modern but informal setting. For around 30 Euros a head, diners can choose between dishes as diverse as suckling goat, turkey with chilli sauce, rice and Mexican tortillas, nigiri (sushi) or maki (Japanese rice with seaweed and different fillings), ribs and hamburgers, Spanish cheeses or pork loin with 'salsa'. Check out the Spanish, Mexican and Japanese menus in PDF format. The restaurant is open every day except for Sunday evenings. 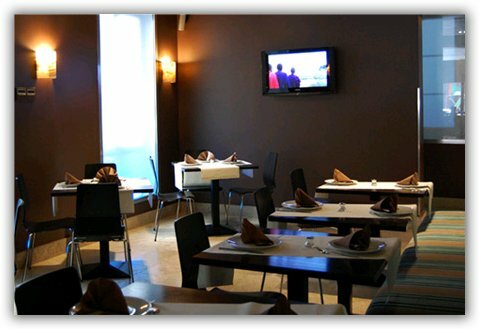 The address of the Amalgama restaurant is: Las Fuentes, 10, 28012 Madrid. The nearest Metro station is Opera. Please see the Amalgama restaurant location map below.